This next story is a bit of a good news, bad news tale. The good news is that a new study has found smokers who switched to e-cigarettes were much more likely to quit than people who use nicotine patches or gum or similar products. The bad news - that those who successfully quit tobacco were often hooked on e-cigarettes. NPR's Richard Harris has the story. RICHARD HARRIS, BYLINE: E-cigarettes are far less hazardous than the ones you light up. American health officials worry about their addictive nature, but British health officials tend to look more favorably upon them. That's certainly the case for Peter Hajek, a public health researcher at Queen Mary University of London. PETER HAJEK: We know that there are millions of smokers out there who successfully stopped smoking by switching to vaping, but that's different from having a randomized trial. HARRIS: So Hajek and his colleague studied nearly 900 people who wanted to quit smoking. Half randomly got e-cigarettes. The other half got traditional treatment - nicotine patches plus gum, lozenges, nicotine inhalers or whatever kind of oral nicotine they preferred. HAJEK: The e-cigarettes were significantly more effective than nicotine replacement treatment. HARRIS: As they report in The New England Journal of Medicine, about 10 percent of those with standard treatment quit smoking for at least a year while 18 percent of the people given e-cigarettes had quit. That's hardly a miracle cure. HAJEK: The figure may sound low, but these type of clients would - if they were quitting on their own, the quit rate would be about 3 percent. HARRIS: In his view, if the technology can more easily wean people away from the much more hazardous act of tobacco smoking, that's a good thing. American health officials and scientists are generally much more leery about vaping, especially among young people. Nicotine can affect brain development. 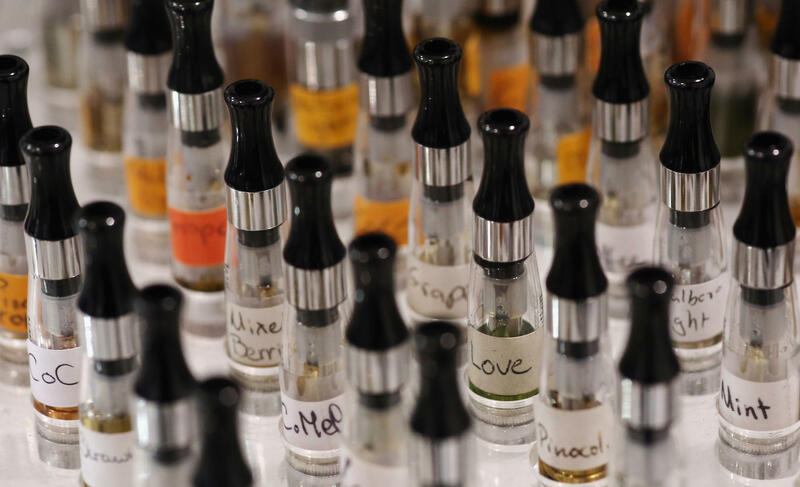 Belinda Borrelli, a psychologist at Boston University, says vaping has vastly increased among high schoolers and young adults. BELINDA BORRELLI: The good news is that traditional smoking has gone down in these populations. But the question is, if we have many adults using e-cigarettes, are we going to renormalize the addiction essentially? HARRIS: She says people who vape to help them stop smoking should at least have a plan to get off the e-cigarettes afterwards. BORRELLI: So the e-cigarettes shouldn't be thought of as a lifelong commitment. HARRIS: Hajek says it's true that many people do keep vaping, but at least it's easier to quit vaping than smoking. Sure, he says, it doesn't solve the problem of nicotine addiction, but that's far less harmful than tobacco use. HAJEK: And so it would be very similar to drinking coffee. You know, you've got a lot of people who have to have their cup of coffee every day. They do it because there's a stimulant drug in it, and it's very similar to using pure nicotine without the toxins, which actually kill people. So from our point of view, this side of the pond, this is now not a public health issue anymore. HARRIS: But it very much remains one in the United States. Richard Harris, NPR News. Transcript provided by NPR, Copyright NPR.